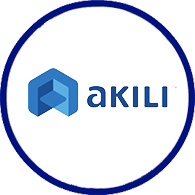 Akili Interactive is a prescription digital medicine company combining scientific and clinical rigor with the ingenuity of the tech industry to reinvent medicine. The company is developing novel prescription medicine and assessments delivered not through a pill but through high-quality action video game experiences that have been designed to directly treat cognitive dysfunction associated with a range of medical conditions. Akili is advancing a broad pipeline of programs, built on its patented technology platform, to treat medical conditions across neurology and psychiatry, including attention deficit/hyperactivity disorder (ADHD), major depressive disorder (MDD), autism spectrum disorder (ASD) and various inflammatory diseases. Akili recently announced positive results from a multicenter, randomized, controlled pivotal study of its lead candidate, AKL-T01, in pediatric ADHD. Akili is preparing to file AKL-T01with FDA for clearance which, if granted, would enable it to be prescribed by physicians as a stand-alone treatment for children and adolescents with ADHD. If approved, AKL-T01 would be the first prescription digital treatment for pediatric ADHD. Akili Interactive is a founding member of DTA.